Champs Sports, a division of Foot Locker, Inc., is the one of the largest athletic specialty store retailers in the country, offering a broad selection of footwear and apparel and Fan Gear for every major team sport. Whether it's MLB, NFL, NBA, NHL or NCAA, Champs Sports has what everyone is looking for! The Champs Sports Gift Card is redeemable at over 500 in the U.S. 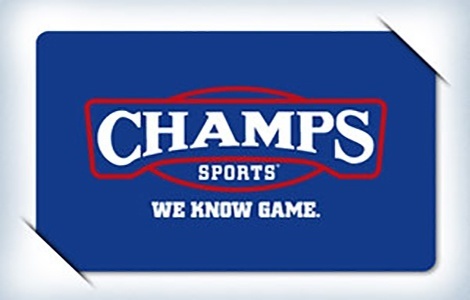 Champs Sports Gift Cards are also redeemable online at www.champssports.com. Our gift cards have no expiration date or dormancy fees. National Gift Card is the best place for you to order Champs Sports gift cards in bulk. We are the experts in all things gift cards and can set up your gift card solutions program for you today. Please contact us for more information on bulk, direct-to-recipient, or individual gift card fulfillment for your gift card program. Contact us here or call us at 888-472-8747 today!